This is what Tourneau 'Time Machine' Repair Dept. NYC (they also sent the watch to Bulova corporate HQ Repair Dept.) wrote on the repair receipt: 1. Case serial number "9401471" (marked on outside back cover) 2. " B - 10K GOLD FILLED " (marked on outside back cover) 3. " 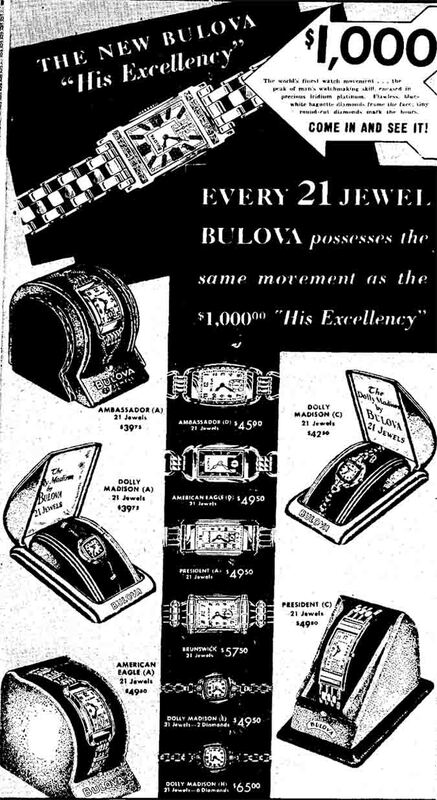 Bulova Fifth Avenue New York " (marked on inside back cover) 4. Watch movement: " 17 Jewels " ... then, on a subsequent repair Tourneau repair dept. stated, " 21 Jewels " 5. Caliber: " 10 AE " 6. Dial Color: " Beige " 7. Size: " M " 8. Tourneau repair dept. stated, "Made 1945" 9. Tourneau repair dept. stated, "Retail in 1946 $65.00"
I went through ALL ads, one by one, on this site starting from 1935 - 1950 in order to find an exact visual match of my Grandfather's watch he passed down to me. The only ad to me that showed an exact match is above. And " B. Alden " is it by way of what my eyes have seen. Please let me know if that is incorrect. Look forward to hearing from the experts to obtain as much factual information on this watch as possible ... your help is very much appreciated. Question: Why do you say the 'AMBASSADOR' model? Looking at the adverts from 1939, I see one showing that model and it is not mine (as shown above). The advert I attached above showing the " Alden " model looks to be an exact match ... no? I gotta say that Alden does look pretty good... espcially when the ad and the seconds ticks match perfectly. Pretty hard to see if the ad for the Alden has tubular lugs as the subject watch. 5th may be on to the lug match but I'm not so convinced. Could be but I'm not certain till I look some more. Check the lugs on Your Watch, they appear to be the stirrup type found on the Ambassador from the images. Agree with Ambassador ID, 10 AE 21 jewels used in the pre 1941 Ambassadors. This is not the first with engraving, as we have a couple in the Lone Eagle files that are incorrectly ID'd, and should be flagged for review. Here is a pic of the above linked 21 jewel 10 AE watch. Pic of the above 21 jewel 10 AE watch. Gents, You guys are good. REEEEEAL good. You nailed it from the start. Take a bow! Many many THANKS. The picture directly above, "Ambassador, 10 AE 21 jewels" is my watch to a T except that the face is clean & bright and does not show the patina age of time upon it. A couple questions comes from this: 1. Can you post or e-mail to me all the details/history/any advertisements about my particular Ambassador model? 2. Should I have the face thoroughly cleaned in order to achieve the clean & bright look? 3. Why ... does the 1941 advert, " B. Alden " model look exactly the same as my Ambassador model from ALL appearances? 4. Why ... does the 1939 advert, " 4353 Ambassador " look so dissimilar to my Ambassador model year 19_?_. No ads for the engraved model in the regular ads, but this is the best there from 1939, with the Alden and the Ambassador, so you can see the differences. The Alden possibly had a Stainless Steel back, with a lesser jewel count. The patina on your dial adds to authenticity, and does not look too bad, but it is a matter of personal preference. If you are happy with it as-is, leave it alone. It looks great to me! 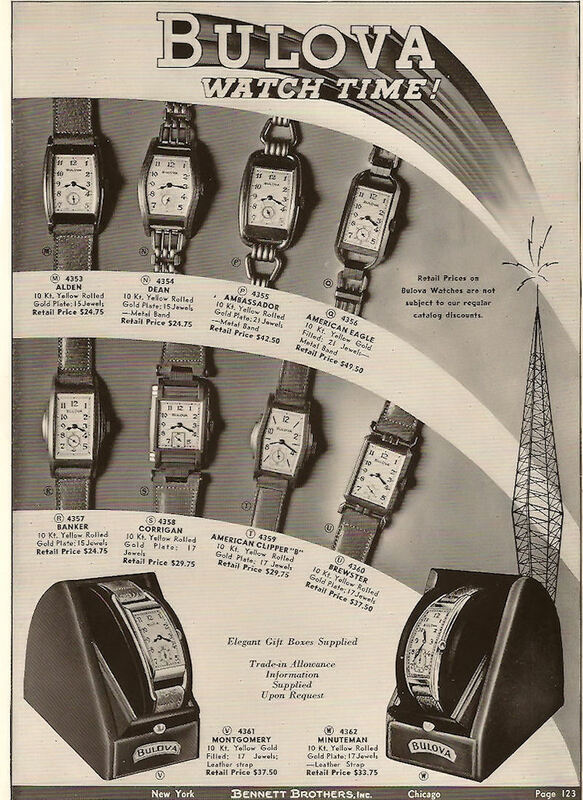 Here is an ad from the part ads from 1939, with the engraved Ambassador "D" being the closest to your watch. Would agree that tthe subject watch is not an Alden as the lugs on an Alden have a distinct angled bend were as the subject watch is curved. Plus the Alden has a 15 jeweled movement. Nor is it a Commodore which is a 17J version. A 21J Ambassador would be my call as well. I'm not certain its a "D" variant as that may be down to the bracelet. So generic Ambassador for me.